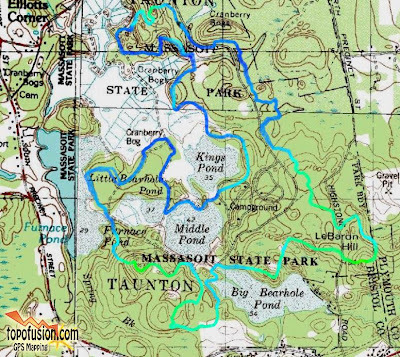 I got up to Massasoit State Park in East Taunton, Mass, around 10:30 AM to ensure that I had plenty of time to pre-ride the course and it was extremely worthwhile. After registering and getting my Bib I headed out onto the course. The first part through mature pine forests was fun because it was cool and no breeze. Parts of the trail were soft in some places and there was one really long bridge. Eventually the course came out of the forest and it became sandy as you got closer to the ponds. The terrain was wonderful and my gearing selection was good because it enabled me to make most of the climbs. Doing this pre-lap let me learn the ins and outs of the course. There was a sand pit before a little climb that I hit in the middle, that was a mistake, which took the wind out of my sails, almost forcing me walk the incline. There was another sandy climb that curved around to the right that if you were going fast and tried cut on the inside the sand would stop you cold. And there was one section that was extremely rooty, more so than others, that if tried to take it high it was worse than hitting down low. Three quarters of the way through the Pros & CAT 1s came barreling through and man were they fast. Towards the end of the course there is a hike-a-bike that was killer. Once you got past that climb you descended some more to one last fall line hike-a-bike, a final kick in the teeth, and then there was a nice downhill and then you were out on the road to the starting point. On that last climb I ran into John Groller who was taking pictures of the carnage on the last hike-a-bike who took the two shots below. After the pre-lap it was back to the car for a little bike maintenance, PBJs (Rs are for afterwards) and 32oz of Powerade to pre-hydrate for the race. I have finally given up on my carbon fiber seat post. I think I am too heavy for the restraining bolt that holds the seat in place because it keeps moving back on me. My bike was making an awful noise which I noticed earlier this week and I finally deduced that it was the bottom bracket. I learned later that I need an Isis crank puller, something not included in my bag of tricks, in order to get the crank off so I had to live with it. I was surprised at the amount of port-a-johns, only 4, they had here because at 15 minutes before race time I needed one and the two by the finish line had lines in front of them. I raced up to the two outer ones and they were free. The CAT2 SS Open class started after the 40 to 49 year old group but included with us were the junior men. There were 10 racers and in the line we were all taking about our gearing. One guy came to the party at 32:14t and he must have been an animal because I never caught him. Most people seemed be geared for 32:20t like me or 32:18t. I think 32:19t would have been perfect. At the whistle I hung towards the back but found myself with one person behind me at the first turn into the woods, I had looked at the field and thought that out of everyone there, there was guy that I could probably best. It was a really different feeling racing because the adrenalin was coursing through me and I was actually trying to keep up with those in front of me and all I was thinking was keep up, keep up. Right before the first rooty climb, one of the racers dropped due to a loose seat clamp and that put me into 8th place by the first 2 miles into the course. That was a first, people behind me and I could see people in front of me. Into another section of climbs, which I cleaned one and walked another and I was starting to catch the guy in front of me. The guy with the seat clamp issue, on a Fetish Fixation - hey I had one of those but this was the gun metal blue one, much older than mine - was dogging my six as well. This went on for the rest of this lap and into the next. On the second lap, I lost sight of the guy in front of me and the guy behind I caught glimpses of when I would finish a climb he would be just starting. Three quarters into the second lap I started to catch the guy in front of me and finally passed him right before the second hike-a-bike. He had cramps. When I got onto the straight away I sprinted towards the finish line. It was like spin class and I was riding that bike like I stole it! I even passed a geared rider coming into the finish line. My final time was 1 hour 39 minutes and I took seventh place. That PBR (not J) after the race was the best thing to wash down all that dust. My first lap had an average speed of 9.5 mph but I slowed down on the second lap to 8.6 mph. Pre-hydrating and carb'ing up before the ride really helps and I did hammer gels 3/4s of the way through each lap which really helped, too. This was a great race and the first time I ever bested someone, the guy on the Fetish. 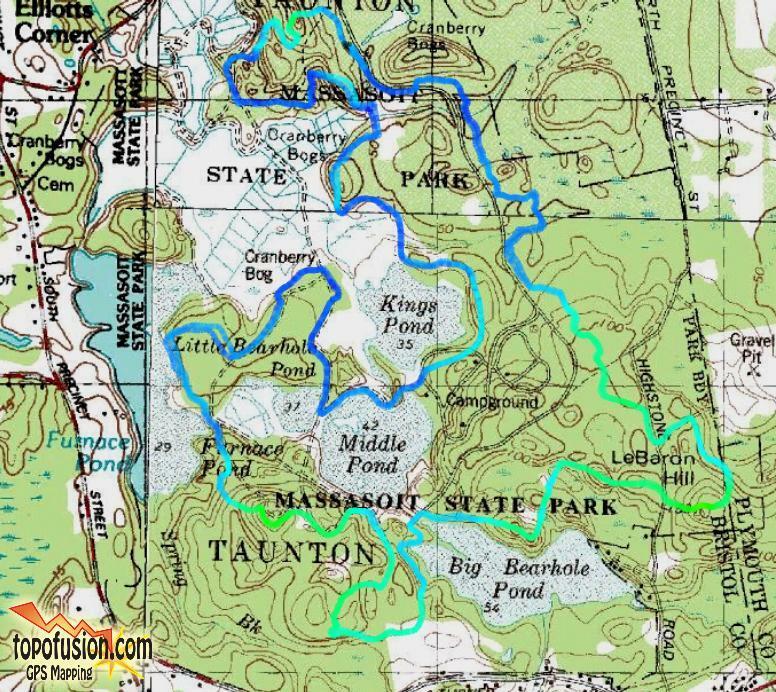 Unfortunately, I won't be racing until June again so I have the whole month of may to get ready for the race in Ware, MA. Still, this is my 3rd Race for NEMBA Racing (Fbook link), one more to go! 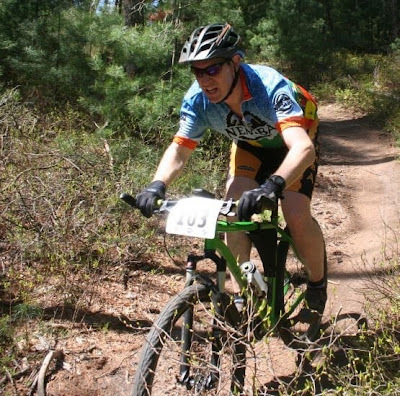 However, unlike most people who went home after the race, I stayed in Massachusetts because on Sunday I was attending the New England Mountain Bike Association's quarterly Board of Director's meeting, which I am now a member of. Of course, that meant more riding! Very nice man, congrats on the finish position! Love the pics too, definitely can see the intensity! Taking it to a whole new level - getting serious! Dude, it's going to be really cool to follow your racing exploits! 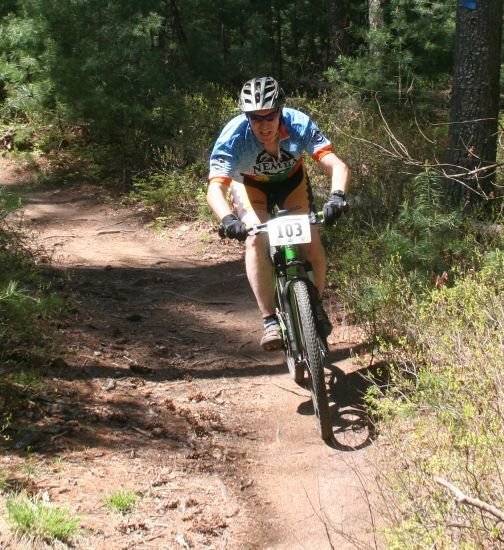 Just saw your post on the Singletracks forums... didn't know you were on there! I was hot and heavy for awhile on ST but then I got busy with my other blog. Which is that, the one for CTNEMBA? Yes. One blog is doable but two takes up a lot of time.